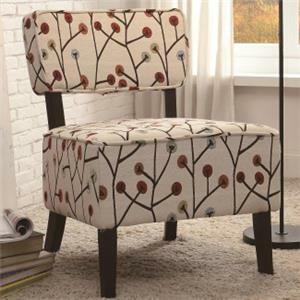 Decorative fabrics offer this armless accent chair unique flair. The exposed wooden legs are tapered in the front while the rear legs have a splayed appearance. Rest comfortably while you lean back against the padded upper seat back. The Orson Casual Armless Accent Chair by Homelegance at Value City Furniture in the New Jersey, NJ, Staten Island, Hoboken area. Product availability may vary. Contact us for the most current availability on this product. Browse other items in the Orson collection from Value City Furniture in the New Jersey, NJ, Staten Island, Hoboken area.